The secluded holiday complex is very attractive for strolls along the picturesque coast and for water sports practicing. It is located 60 minutes away from Varna and Bourgaus airports and only 10 minutes away from the nearby towns Byala and Obzor. Sol Luna Bay Resort offers 458 spacious and tastefully decorated rooms where you can experience full comfort and relaxation. Especially attractive for families are the suites which offer accommodation possibilities for up to 5 guests. Featuring warm and welcoming ambience they consist of two bedrooms and provide more privacy during the best time of being together. 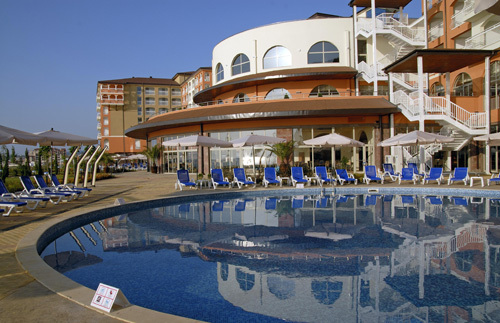 Sol Luna Bay Resort cares for the comfortable stay of guests with disabilities. It is fully wheelchair accessible and features special access rooms with wheel-in showers, shower seats, grab rails, toilet raisers and emergency call buttons. 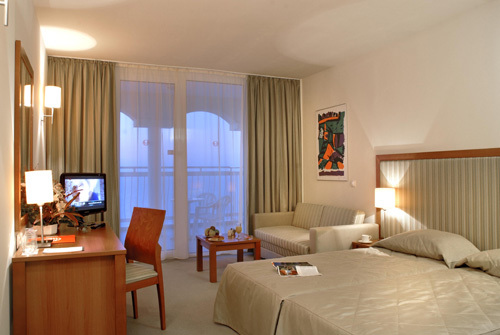 The double rooms for disabled people are ajoined with double rooms for companions. At Sol Luna Bay Resort you can enjoy full relaxation, breaking away from the noise and bustle of the big crowded resorts. Delight in the sun while lying near the pool, relax in the warm Jacuzzi, restore your energy with professional therapies in the modern SPA center, refresh yourself in the sauna or just stroll along the secluded quiet beaches. 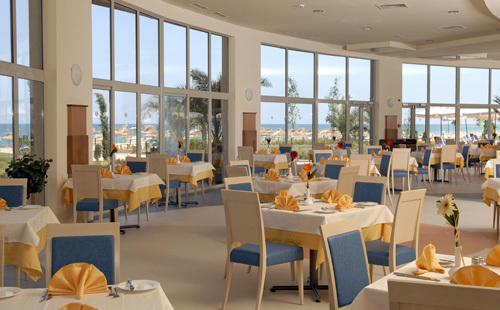 Sol Luna Bay Resort offers two main restaurants - up to 800 and 600 people surving buffet menus of diverse delicious Bulgarian specialties and refined international cuisine. Lobby bar and pool bar are also availabale offering local drinks and snacks. The complex features three conference halls where your private meetings and different business activities could be accommodated. There are two halls with capacity for up to 50 and one for up to 80 attendants with full range of presentation equipment. Obzor - one of the oldest Black Sea settlements. Nowadays, the remains of columns and statues of the Roman Jupiter’s temple are exposed in the small park of the modern town. The Emine cape is located 14 km south of Obzor. There is a lighthouse and remains of the ancient Bulgarian fortress Emona. Bjala is attractive with the Roman fortress where many Greek and Roman coins were found. These finds are exhibited in the “White rocks” center in Bjala. It is also famous for its wine – growing, especially for its “Dimiat” wine. 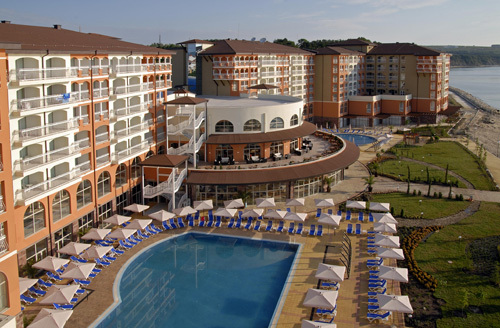 Varna, the biggest city on the Bulgarian seaside coast, is just 50 km away from Sol Luna Bay Resort. There you can find Thracian excavation sites, Greek and Roman vestiges, as well as the Oldest Gold in the World Museum. The historic town of Nessebar, situated on a small romantic peninsula, surrounded by the beautiful sea, is a part of the UNESCO World Heritage list. Its ancient spirit combines fortresses’ ruins, numerous churches and relaxing atmosphere.